Click the image above to start a slide show of the various image in this set. The slide show application has various tools including a button at bottom right to zoom to full screen. Let go of your mouse or trackpad and the slideshow will run automatically to the end or until you stop it. Use your browser’s back button (left arrow) to return here. Note: Those of you who have tried my other slide shows, I’m trying this one in a new window (on top of this one) to make it easier to bail and get back here by simply closing the new window. Let me know what you think either way, thanks. 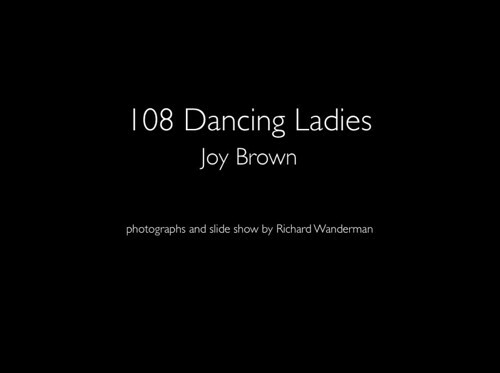 This set of images documents the process of the artist Joy Brown making her newest collection: 108 Dancing Ladies. These images were taken with a Canon EOS 5D camera and for the most part, a Canon EF 24-70mm f/2.8L lens.